Your table top displays don’t have to be like everyone else’s! Table top displays are an essential part of your marketing arsenal. This is especially important for exhibitors starting out in small booths and conferences. In fact, for many Chamber of Commerce events and regional shows, a table top display is sometimes all the room that you get. As you can see, it’s critical to make the most of it! Your tabletop display and the printed trade show table covers underneath are what your passers-by will see first. These display tools need to immediately convey what your business is all about. They also need to help your prospective customers decide whether they want to stop at your display and learn more about you and your business. There are some reliable, basic trade show tabletop displays and table throws that are simple to use, easy to carry around, and very reliable. These units are designed to fit your budget and provide economical starting places for new businesses. There are also some very creative trade show table top displays that are truly amazing, that help give color, style, and make you standout even in that very small display space. While all of them give a specific shape or idea, they can be customized to help bring your own logo, branding, and personality to each one. These unique table top display boards are very popular for good reason. That’s because they’re complete display units that can fold down into a portable briefcase. Think of them a little like the pop-up books of old that folded down and then sprang to life when opened. With clever engineering, your customized display graphics never get damaged when folded down, and you can easily pack up your table top display boards much sooner when the event or meeting is over. The Showmax briefcase is the largest tabletop display board kit, providing a 3Ft High x 6Ft Wide trade show tabletop display – a complete self-contained trade show in a briefcase! For another variation on the portabitablity factor behind your table top displays, you can find an attache case that conveniently holds small products you’re selling. Simply open it up on a table and you have a small shelving unit that can display various small-sized products. It’s perfect if you’re selling a product in small containers or bottles. The display is designed so the product can easily be picked up for customer inspection. This display unit is one that provides real style in its design and shape. It’s specifically designed to display interesting facts about your business. Available in different shapes and variations, it’s a frame that can be divided up into three or four quadrants to display information or graphics. 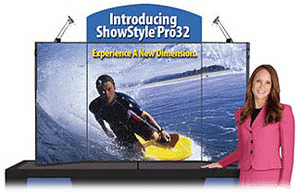 What makes the Xpressions Salesmate tabletop displays so popular is that they’re incredibly light and just as easy to set up and fold down as the simplest briefcase displays listed above – and you can also swap out graphics in seconds, changing the pictures to suit your event or sales pitch. With the ability to showcase colorful images on these uniquely shaped frames, you can customize them to bring a wow factor to those passing by. They’re quite different from any other type of tabletop display unit and come highly recommended, with a lifetime warranty on the hardware. A backlit trade show display always manages to get increased attention at trade shows. More and more trade show booths incorporate backlighting, but there aren’t many backlit tabletop displays on the market. That’s been amended with our curved backlit VBurst table top display which can set up in seconds and be put away in just as short of time. And we recently added the Expo-light backlit table top displays, giving us two backlit table top displays now. Underneath your tabletop displays, normally, is a table. There’s no reason to leave the plain black unprinted cloth there that the show provided. Instead, printed trade show table covers can help you make a bigger and more professional impression on your clients. While some people may not think details matter, they do. Customers take notice of every detail when visiting trade shows, and standing out in a professional way is the only sure way to make that first impression a good one. Visit us here at American Image Displays to find out more about our table top displays and matching table throws. As in many of life’s endeavors, “the devil is in the details”, and we can help you be sure that you’ve taken care of all of the important details in shopping for portable trade show displays for your next public networking event.